Every wardrobe needs a basic foundation to build your style around. Within these solid go-to pieces, you can then build off your style. My basic wardrobe foundation is heavily influenced by classic wardrobe pieces and none more so than a black blazer. The blazer is the one piece of any wardrobe that stays in heavy rotation all year long; it allows casual pieces to look dressier, tops off floaty dresses and is always work-wear appropriate. Wearing the blazer atop your favorite white tee, skinny jeans and heels takes what could have been a simple jeans and tee style to a more structured, thoughtful and fashionable style. A sweet dress takes on a more serious downtown style when a blazer is thrown over the look and any outfit instantly becomes a “work” outfit when a blazer is thrown on top. I’ve often spoken about the importance of investing in your wardrobe and feel that when it comes to the items that you will wear year after year, the expense of a quality piece is worth it. My go-to blazer is the curved-hem blazer from Ted Baker. This style works well for many reasons; the cut is classic, the lack of lapel keeps the style workable for any season, and the bracelet-length sleeves allow for jewelry to become a visible statement. 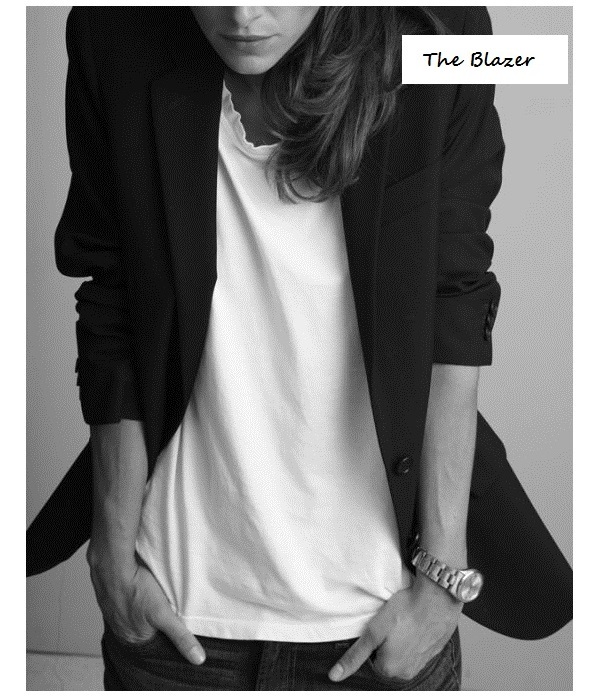 Another option is the equally minimalist HELMUT Helmut Lang blazer or the classic schoolboy from J. Crew.